your firebox with spectacular yellow dancing flames. 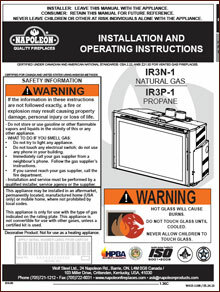 The IR3 features Napoleon’s advanced infrared technology and is perfect for smaller living spaces. The IR3 is great for home owners who want the cost saving benefits of Zone Heating (heating the room you use most) plus the benefit of replacing an old drafty masonry fireplace with an efficient heating source.